This is a flexible material primarily used in products wherein it is important to increase night time visibility in an approaching drivers’ headlamps e.g. HSRP, traffic lights, high visibility clothing etc. HSRP uses high grade RRS which thus ensures enhanced visibility from a distance of over 200 metres. Holograms are used in many products chiefly as a security feature. The hologram is hot stamped at an extremely high temperature which makes it practically impossible to be removed or tampered with using bare hands. The hologram also bears the image of a “Chakra” in blue colour which further strengthens the security feature. The letters / numerals are hot stamped with a specialized hot stamping foil bearing the inscription “India” in blue colour. The type of ink used for this inscription is based on pearlescent pigments which causes the change in colour of the product while viewing from different viewing angles. This further acts as a deterrent for fake registration plate manufacturers. This is a laser alpha numeric code of minimum 9 digits, etched in the bottom left hand corner of the HSRP. 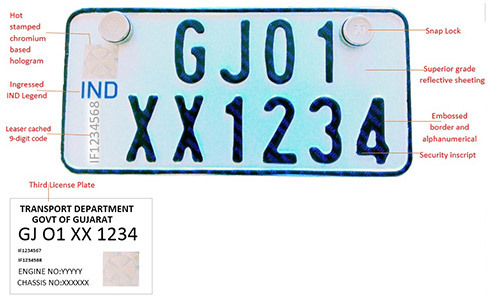 This code is unique to a plate and is used for linking the details of the vehicle owner to that of the central database stored in a secure server. In the not too distant future, traffic wardens would be equipped with LID readers which would aid in quickly identifying miscreants in hit and run / road rage cases. As an enhanced security feature, apart from the registration marks (HSRP) on the front and rear of the vehicle; a third registration mark in the form of a self destructive chromium based hologram sticker is affixed on the top left corner of the windshield of vehicles. Details such as registration number, front / rear LID numbers, registering authority details are provided in this sticker. In the event of replacement of either the front or rear HSRP, this sticker compulsorily needs to be replaced. This is an external fastening device used for bolting the HSRP on the customers’ vehicle. The design of the snap lock is such that once fastened, it can not be removed or reused in it's original form. As per the Motor Vehicles Act, the use of such snap locks is restricted to the rear of a vehicle. The snap lock system is a globally acclaimed and recognized system for the fitment of HSRP.